Did you know TSBs could be your golden ticket to a quick fix? As a technician, you probably know a bit about TSBs, but there may be more to the story than you might expect. Recently, Mitchell 1’s Senior ProDemand Marketing Manager, Gary Hixson, had the opportunity to sit down with Motor Age Magazine and share some of his insights about TSBs. We felt the auto repair information could be helpful to our readers, and we didn’t want you to miss out on these juicy TSB tidbits. Add to your arsenal of TSB knowledge by reading these Q&As between Motor Age’s Special Projects Editor, Tschanen Brandyberry and Gary Hixson. Watch the full version now! MOTOR AGE: Today, we are discussing TSBs. It might seem simple and techs could say, “Well, I know to look them up. What’s the big deal?” However, with the complexity of today’s vehicles, it is a big deal! Technicians must know where to look in their shop’s auto repair information, what to look for and how to determine if the TSB is applicable. Also, as more TSBs are issued, making sure they are the most recent ones is important. Gary, let’s start at the beginning with what a TSB actually is. GARY: A TSB — Technical Service Bulletin — is a type of service information released by the original equipment manufacturer (OEM) based on service issues they are seeing in the field. There are many possibilities why a manufacturer would release a TSB:The OEM could have noticed a pattern failure as the vehicle is driven by consumers. The TSB is written to alert the service technician of the proper way to service/repair the vehicle. Below is an example. 1.) The OEM could have noticed a pattern failure as the vehicle is driven by consumers. The TSB is written to alert the service technician of the proper way to service/repair the vehicle. Below is an example. 2.) The OEM could have erroneous data in their service manual. They then release a TSB to overwrite or replace that incorrect data. 3.) The OEM could have switched parts for the vehicle during the production run, therefore requiring that they update information via TSB. 4.) The OEM also could have developed a special tool to help the technician become more efficient at servicing the vehicle. MOTOR AGE: How is a TSB different from a recall or a campaign? 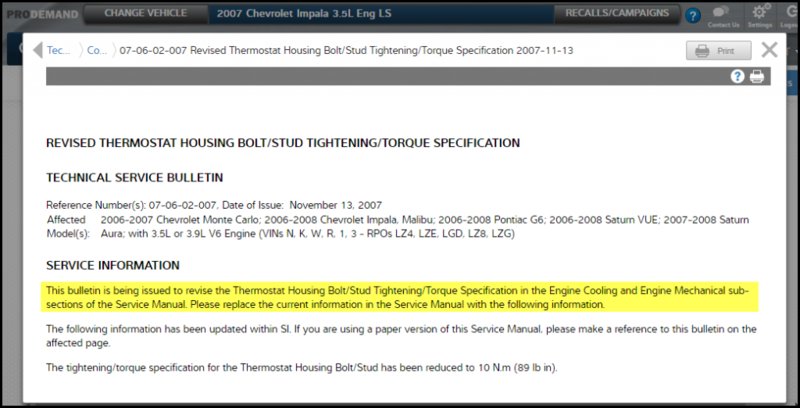 GARY: Within ProDemand auto repair information, TSBs are grouped with recalls and campaigns because these items all represent post-production information based on lessons learned using and servicing the vehicle. A recall is released by the National Highway and Traffic Safety Association (NHTSA) when there is a potential transportation safety issue. I used the word transportation because NHTSA could issue recalls on vehicles, tires, car seats or any type of equipment. 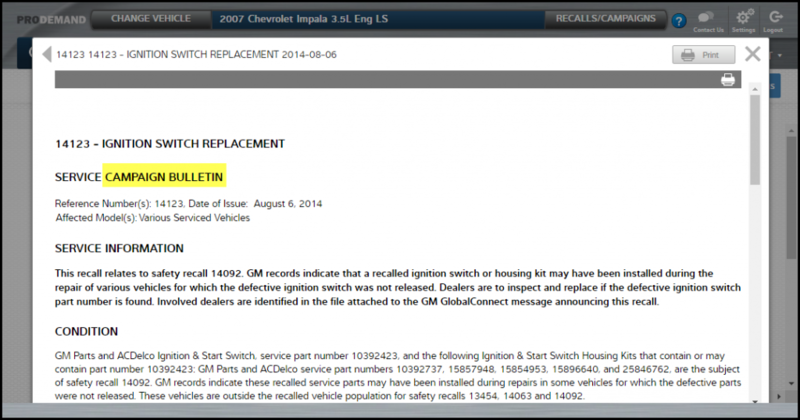 The OEM must send out notifications to the consumer, so the consumer knows to take action to repair the vehicle. Typically with a recall, the consumer is able to return to a licensed dealership to have their vehicle or equipment serviced for free. Campaigns are similar to recalls in that the consumer is notified about a problem with their vehicle. But campaigns do not involve a safety issue and, therefore, are sent out by the OEM (not by NHTSA). The repair cost for a campaign may or may not be covered by the manufacturer. 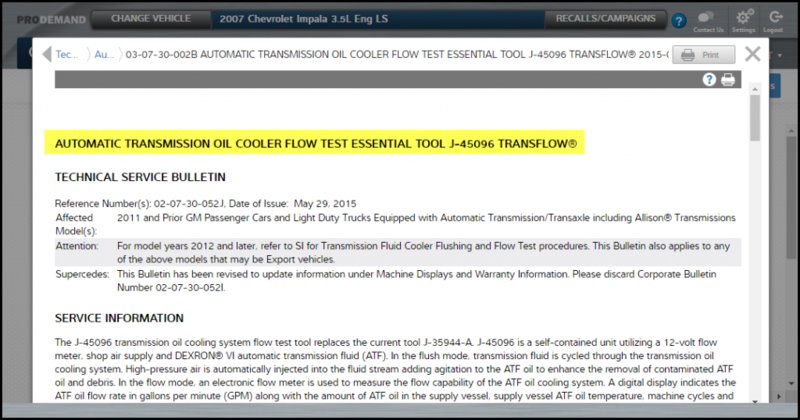 MOTOR AGE: From an automotive technician perspective, why are these bulletins important? GARY: Put simply, a bulletin is a form of diagnosis. OEMs release TSBs based on seeing pattern failures for their vehicles. Not only will a repair shop benefit because the OEM has already identified the problem, but they’ll also give technicians the step-by-step correction procedure. The OEMs recognize that it is in everyone’s interest to have all technicians able to service their vehicles as efficiently as possible. MOTOR AGE: When should a technician look for these bulletins? GARY: Generally, recalls and campaigns should be looked for when the tech first identifies the vehicle. 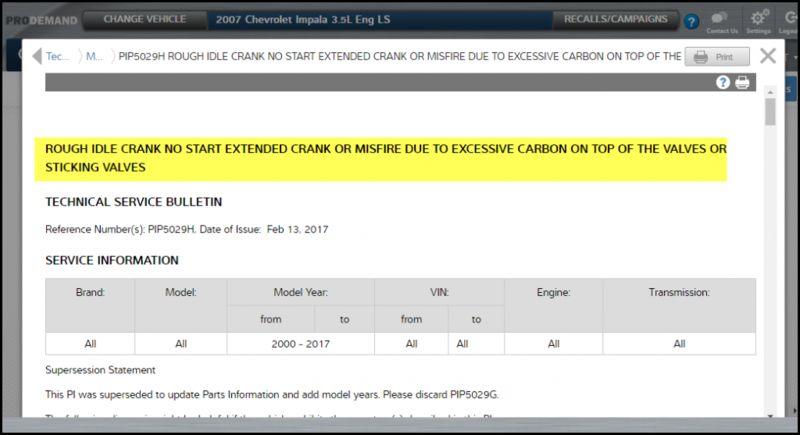 If there is an open recall on the vehicle, the OEM dealership will service that recall for free (for campaigns it depends on the situation). Aftermarket shops want to make to catch those prior to starting the job. You don’t want to have to explain to the customer why you charged them for something they could have had for free. TSBs should be the first pieces of information you look up as part of a diagnosis. The OEM has already done all the hard work by identifying the symptoms, diagnosing the issue and providing the corrective procedure. As a technician, you just have to follow the instructions. Finding a TSB for the diagnostic issue is your best case scenario. ProDemand offers a great example of the proper workflow for a technician’s lookup. 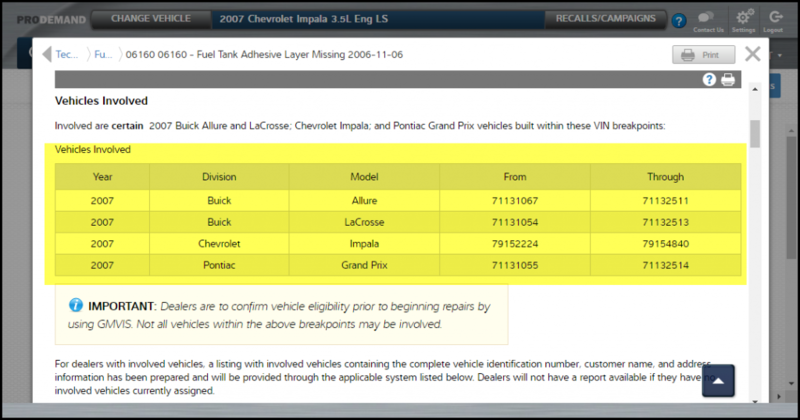 When you first identify a vehicle in ProDemand, you can look right along the top of the screen, next to the vehicle description, for the “Recalls/Campaigns” button. This button immediately lights up to return just the recalls and campaigns associated to the vehicle. TSBs are easily accessed in their own Quick Link or as part of a diagnostic lookup. When using 1Search Plus, the TSB card is the first card returned when there is a relevant TSB. For example, let’s look at a 2007 Chevy Impala 3.5L, C0040. In the screen below, you’ll see right away there is a TSB for a C0040. 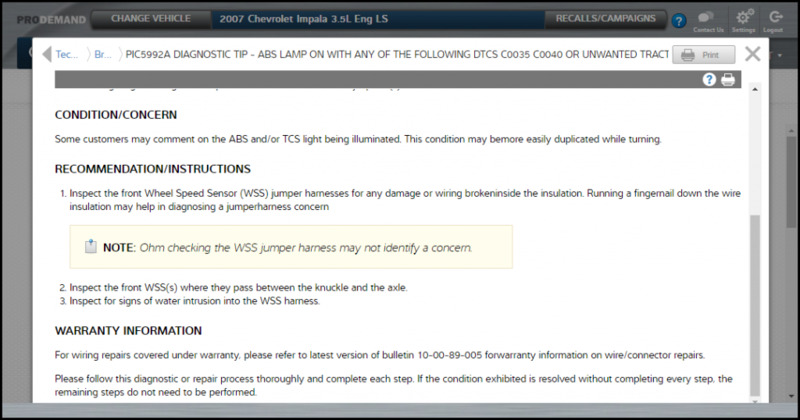 This TSB tells us to immediately check the wheel speed sensor jumper harnesses for damage. The OEM testing procedure takes you down a few different paths first, prior to checking wires and connectors (but not specific wires and connectors). MOTOR AGE: How many TSBs are in ProDemand? How are they processed? GARY: Would you believe there are over 131,000 TSBs in ProDemand? That number grows by over 7,000 TSBs every year as OEMs continue to produce and update TSBs to cover the service life of all their vehicles. At Mitchell 1, we have a dedicated staff of editors assigned with adding bulletins into ProDemand. The editors continually look for fresh bulletins from the OEMs. As we receive this content, the editors format the content to show correctly within ProDemand. Our rule is to have all TSBs into ProDemand and accessible to our customers within a month of publication from the OEM. MOTOR AGE: Is there any new technology with bulletins? GARY: Recently, OEMs have been adding multimedia formats, audio and video files, to their bulletins. This is extremely helpful for instance when the issue is strange noise coming from the vehicle. Having an audio file of a noise is much more useful than trying to understand what the noise sounds like through a written description. The videos also tend to include step-by-step corrective instructions with a knowledgeable instructor leading the way. ProDemand exclusively provides these multimedia files in our bulletins. Let’s take a look at a 2015 MBenz C350 4matic. We click the TSB Quick Link and type in Li46. There are two media files with noises, one from under the vehicle and one while driving. 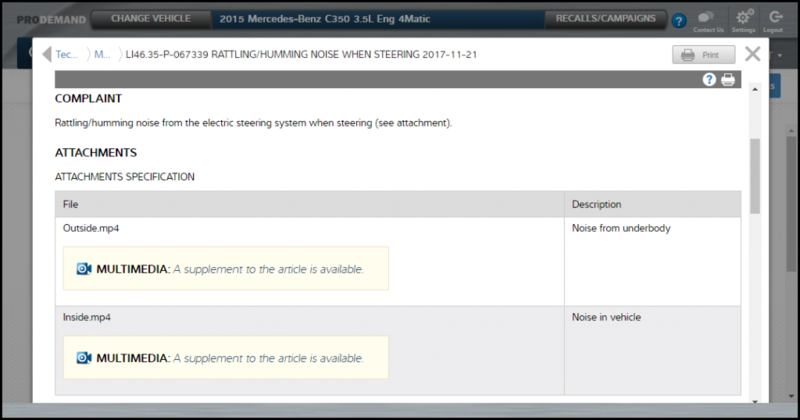 Now, imagine a vehicle comes in with a noise; the TSB states “rattling/humming.” Does that noise from the vehicle match with what you think of when you think of rattling/humming? Most likely it is different from the sound you had in mind. But with the media option, technicians can hear exactly what that noise is and match it to the noise of the vehicle in their bay. MOTOR AGE: What makes Mitchell1 unique when it comes to TSBs? GARY: We’ve already touched on it, but let’s recap. First, ProDemand has the correct workflow for accessing bulletins. 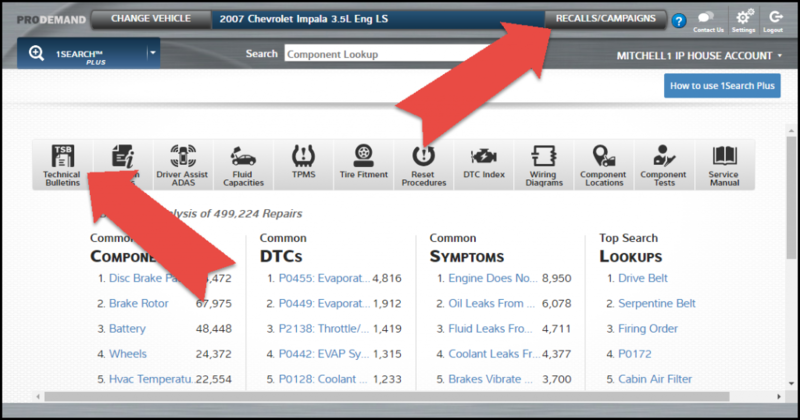 Right after selecting the vehicle, Recalls/Campaigns, Quick Links and information sets that are part of a diagnostic lookup are the first things you will see. Second, bulletins are quickly delivered by our editorial staff from the OEM into ProDemand. And third, we include multimedia format types to take advantage of audio and video files.